Aesop at College is an unusual book in Creighton's Carlson Fable Collection, a humorous volume from the early 1900s. The book spoofs the best-known of Aesop's fables by warping their moral or bringing the story to an abrupt and anticlimactic conclusion. Almost all of them involve college life. 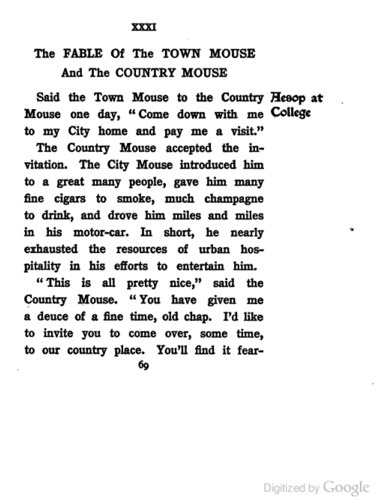 In the book's retelling of "The Town Mouse and the Country Mouse," it is the country mouse who pays the town mouse a visit and attempts to lure him away from city living. The town mouse eventually decides to visit his country companion, falls in love with the country mouse's sister, and decides the country is not so bad after all. The unusual twist this story places on the narrative makes it (currently) my collection's only variant that does not feature an antagonist (in every other case, the mice are interrupted or frightened by some horrible element of city life, say a cat, but in this version everything proceeds peacefully). Notice that even this version highlights distinctive "town foods" and "country foods" (in this case cider and champagne).